Inaugurated in 1973, the Sydney Opera House is a great architectural work of the 20th century that brings together multiple strands of creativity and innovation in both architectural form and structural design. A great urban sculpture set in a remarkable waterscape, at the tip of a peninsula projecting into Sydney Harbour, the building has had an enduring influence on architecture. 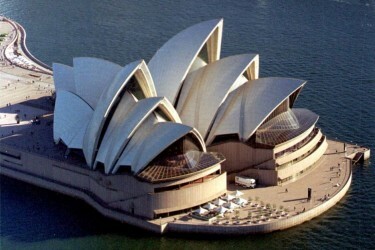 The Sydney Opera House comprises three groups of interlocking vaulted ‘shells’ which roof two main performance halls and a restaurant. These shell-structures are set upon a vast platform and are surrounded by terrace areas that function as pedestrian concourses. In 1957, when the project of the Sydney Opera House was awarded by an international jury to Danish architect Jørn Utzon, it marked a radically new approach to construction. The distinctive roof comprises sets of interlocking vaulted ‘shells’ set upon a vast terraced platform and surrounded by terrace areas that function as pedestrian concourses. The two main halls are arranged side by side, with their long axes, slightly inclined from each other, generally running north-south. The auditoria face south, away from the harbour with the stages located between the audience and the city. The Forecourt is a vast open space from which people ascend the stairs to the podium. The Monumental Steps, which lead up from the Forecourt to the two main performance venues, are a great ceremonial stairway nearly 100 metres wide. The vaulted roof shells were designed by Utzon in collaboration with internationally renowned engineers Ove Arup & Partners with the final shape of the shells derived from the surface of a single imagined sphere. Each shell is composed of pre-cast rib segments radiating from a concrete pedestal and rising to a ridge beam. The shells are faced in glazed off-white tiles while the podium is clad in earth-toned, reconstituted granite panels.